EZIL is a data acquisition application to conduct insertion loss testing on hearing protectors in accordance with industry standards*. By automating the Trident multi-function acoustic analyzer EZIL acquires 1/3 octave data for reference, unoccluded, and occluded sound pressure levels to calculate the attenuation of the hearing protector. 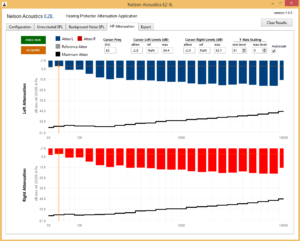 Test results are plotted in real-time and can be exported into Microsoft Excel templates for post-process data analysis. To configure the EZIL software for testing, simply choose the microphone input channels you wish to use to acquire data and the frequency range to be analyzed. An optional input channel for a reference microphone can also be selected, and reference attenuation levels can be entered manually or pasted from Excel. Acquire and plot frequency dependent SPL data for the unoccluded ear via the Trident API with the click of a button. Account for any additional noise that may otherwise skew results, acoustical and/or electrical. Trident acquires this baseline data and EZIL compensates for it when calculating final hearing protector attenuation data. 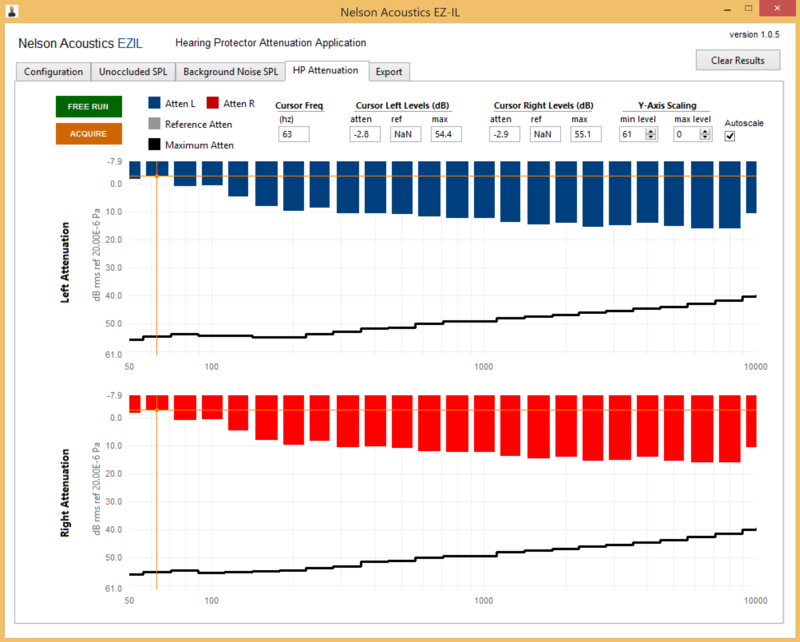 See a plot of left and right ear attenuation calculated in real-time based on unoccluded levels and background noise previously measured. Reference attenuation levels from previous tests and maximum possible attenuation can also be plotted here. EZIL will generate a neatly organized Microsoft Excel file into which your data is exported. The user may also use their own Excel template.